Use of soil microbes to inoculate plants is a favorite method of fertilization environmentally and economically. There are different microbial species used as inoculum including arbuscular mycorrhizal fungi and plant growth promotin rhizobacteria (PGPR) including rhizobium. The microbial species are able to positively affect plant growth by increasing the uptake of water and nutrients, production of different products, controlling unfavorable microbes, interacting with other microbes, etc. It is hence important to prepare suitable inoculums, which are able to act favorably under different conditions including stress. The microbial inoculum must be tested under different conditions so that the most efficient and tolerant species be selected and used. 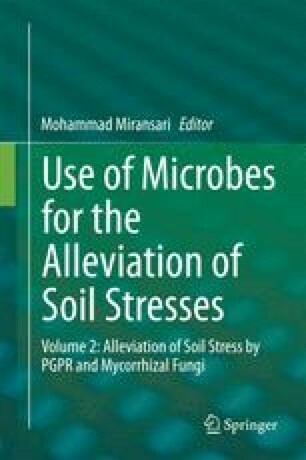 If the microbial species are used under stress, preferably they must be isolated from stressed environments so that they can tolerate and handle the stress more efficiently. If the consortium of microbial species is used, the important factor is the interactions between the microbes, which must be determined and in case of favorite interactions they can be used as inoculum. Some of the most and recent findings are reviewed and analyzed.